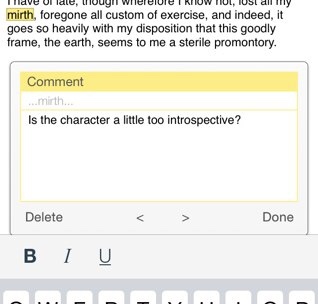 Scrivener for iOS is on the way! I feel like Christmas is coming early. On the same day I grew envious of Mac users once again (the reportedly fantastic Ulysses writing program has just released onto the iPad) I read of the released to in-house beta for Scrivener iOS. And once through the thorough beta testing program, it's coming with the capability for both Windows and Mac desktop Scrivener users to sync through Dropbox. Ah, it reminds me of my old software testing days. I'm very excited to watch how it goes. Incidentally, for those like me who use Evernote and Scrivener on a daily basis, Gwen Hernandez has just posted an instructional on how to use Evernote notes inside of Scrivener. I suffer from similar problems in using Web based imports into Win Scrivener, but am impressed by Gwen's alternative option in exporting first. WTH had I not thought of that? And if you still can't wait for ScriviOS, here's a techie post by Steve Hopstaken on editing Scrivener files on IOS devices via an RTF editor and iCloud sync. KMGN: Scrivener is a wonderful program and I am so glad to see it growing even more. If you haven’t tried it, I highly suggest you do. Lets just say I will believe it when I see it on the App store.